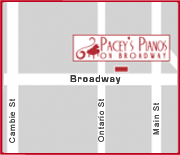 Pacey’s Pianos is located in the city of Vancouver and provides full service for the metro area. We are offer our untouchable piano rent to own plan, piano rentals, new piano, and used piano sales, and we tune and repair pianos. We cover every part of Vancouver and beyond including UBC, Downtown, Burnaby, and south to the US border, north to Lions Bay and east to Mission. Our showroom on East Broadway has some of the finest pianos in the world including Mason & Hamlin, Schulze Pollmann, Knabe and used Yamaha pianos at outstanding prices. Additionally, we offer complete tuning and restoration service in Vancouver. With thousands of piano rentals, we can offer great discounts to tune a piano, move a piano, or rebuild or restore a piano. We are Vancouver Piano Tuners!